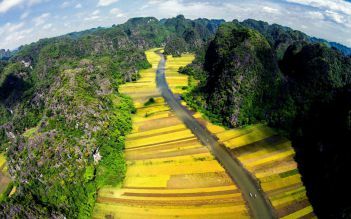 If you are looking for memorable holidays in Vietnam for your whole family, you don't need to look any further. Vietnam Family Holiday 13 days tour will amaze your family with wide range of interesting activities:tasting the most delicious dishes, exploring and joining into the local lifestyle in Mekong Delta, biking to visit rustic villages, learning more about the magical Vietnamese history as well as immersing yourself into the charming of Natural World Heritage of Halong Bay. Enjoy with your family an incredible trip! Upon arrival at Hanoi airport, be warmly greeted by our guide and transferred to the center of city. Check –in hotel. Your hotel room is at disposal at 14:00 pm. Free at your leisure the rest of the day. Following breakfast, we will take part in a cooking class (often from 09:00 am to 12:00 noon). Joining a cooking class is an interactive and fun way to learn new cooking skills and experience the tastes and textures of Vietnam cuisine. You will have opportunity to participate in preparation of dishes under the guidance of experienced chefs at your own station. Later, each workshop will conclude by tasting the food you have prepared, accompanied by local beer or wine, in our comfortable dining area. This afternoon is dedicated to the discovery of Hanoi City. You will have a glimpse at the first Vietnam University - the thousand-year-old Temple of Literature. Next, we will discover the various architectural styles of Hanoi and its famous 36 streets in Hanoi Old quarter by walking and cycling. Come back to your hotel for relaxing. After breakfast, we will go to Duong Lam Ancient Village(60km – about 2 hours by driving). This is one of typical old village of northern Vietnam with many old houses that have been preserved intact. Upon arrival, we will take part in a biking tour along the small ancient alleys to visit Mong Phu Temple, Mia Pagoda, two ancient houses – the biggest 200 - year old house and the most ancient house built 400 years ago. Meet the local people and visit a workshop of hand-made soy sauce. Then continue to visit Ngo Quyen temple and Phung Hung temple where Vietnamese worship two national heroes of Vietnam. Come back to your hotel for leisurely evening. After breakfast, you will leave Hanoi to get Halong Bay via Red River Delta. 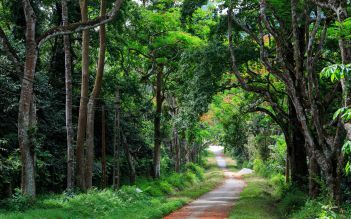 You will have time to enjoy many picturesque countryside landscapes along the road. Upon arrival, you will be welcomed by cruise’s staff and get on the boat. Enjoy your lunch when the boat goes among the unspoilt limestone islets of Halong Bay. Then visit one of the most amazing caves in Halong Bay and relax on a beach by sunbathing, swimming…or have a great time contemplating the sunset on the bay on the sundeck. After the sunset, enjoy a romantic dinner on the cruise before retiring to your cabin for a good night’s sleep. Your boat will cruise back to Halong Pier through spectacular karsts and limestone rock formations, you will have a leisurely morning and visit a beautiful cave before tasting your brunch on-board. Your driver will meet you at the dock for the transfer to Noi Bai Airport to take the flight to Hue. Upon your arrival in Hue, our driver will transfer you to your hotel and free at leisure the rest of the day. This morning, our guide will pick you up at around 8:00 to start a tour to discover about some traditional villages in Hue. 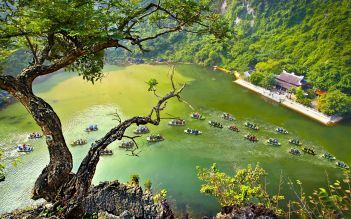 Get on a boat to go down the Perfume River, you will find relaxed feeling when falling in line with fresh and tranquil atmosphere along two sides of bank’s river. Our guide will give you some introduction about some simple but unique places that the boat passing though such as Con Hen Islet, Bao Vinh ancient town. 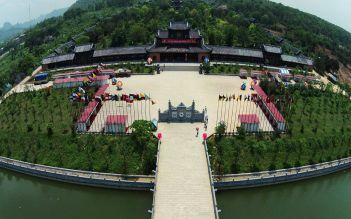 Arrive Sinh Pier, hop on a bike to visit Sinh Village where preserved and developed the traditional folk painting. Then you leave Sinh village and spend time to visit Thanh Tien paper flower-making village with the 300 year-old. For a long time, Thanh Tien paper flower has become culture in the folk beliefs of Hue People. Especially, you will have chance to make a small product by yourself under the introduction of your friendly host. After that, walking around to have a glimpse of beautiful village with the ancient temple and communal houses before enjoying your lunch with local food. In the afternoon, transfer back to the center of city to discover the Hue Citadel, he construction began between 1804 and 1833 under the Nguyen dynasty, surrounded as a fortification guarded by 80 bunkers and a deep trench of 40m large, connected by a bridge in front of the ten gates. Then make your way to the Hue Royal Antiques Museum to see a collection of ornaments from that time. Round off the day by visiting local Dong Ba Market to have a glimpse of local people life. After breakfast at your hotel, our guide will pick you up at your hotel and transfer to Hoi An. You will have opportunity have a beautiful panoramic view looking out over the central coastline via Hai Van Pass. After a beautiful and peaceful stop at Lang Co Beach, we will continue to go to Da Nang to visit Cham Museum. It considered as the world’s largest collection of Cham artifacts – with more than 300 pieces on display including altars, lingas, garudas, apsaras…all dating from the 5th to 15th centuries. 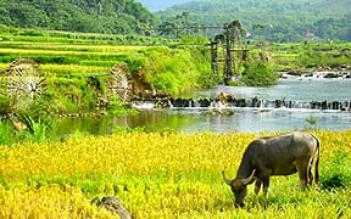 Then we will arrive Hoi An – another UNESCO World Heritage site. Check-in your hotel and free at leisure until be picked up by our guide at around 15:00 pm. After a quick briefing for the safe way of riding back of the motorbike during your trip, we will start heading out for delicious food tasting adventures. You will have opportunity to taste some most delicious Vietnamese dishes such as: sandwiches, Cao Lau – authentic local taste, Banh Beo – traditional cake, Banh khot or Balut – one of the top 10 weird foods in the world. Not only trying some typical dishes, but also walking along Thu Bon River or visiting the oldest pagoda in Hoi An. You will have a beautiful experience when enjoy a unique dance performance done by our lovely guides. After that, you will go to local restaurant by the river to enjoy a special dinner. End the trip at your hotel around 20:00 pm. This morning, the local guide meets you at hotel lobby at around 8:00 am. You will choose a bike and then ride to local farm in Tra Que Village. You will take a trip around the vegetable garden and join in the farmers in preparing the land and fertilizing it with seaweed from local lake, raking the ground, sowing, watering greens…You will join with your hostess to prepare the lunch with specialties such as “Tam Huu”, “banh Xeo” or local pancake. After your lunch and the exertions of the morning, take an even more traditional Vietnamese post-prandial nap before learning how to harvest and wrap the vegetables. 13:00: Let's us bid farewell to your host family, ride back to Hoi An. Visit Japanese tomb on the way back. We will stop at Japanese tomb. After that, come back your hotel and will have a leisurely afternoon. You will have a whole day at leisure in Hoi An by walking around ancient city to discover as you wish or get more activities in the beautiful Cua Dai beach. Free at your leisure until our driver picks you up and transfers to Da Nang airport for your flight to Ho Chi Minh City (about 1 hour 30 minutes flying). Upon arrival, be warmly greeted by our driver and transfer to your hotel for check-in. The balance of the day is free. In the morning, our local guide will pick you up at hotel around 08:00 to transfer to Cu Chi Tunnels (30km to 40 km from Saigon). At its height, the tunnel system stretched from Saigon to the Cambodian border. The network, parts of which were several levels deep, included innumerable trap doors, specially constructed living areas, storage facilities, weapons factories, field hospitals, command center and kitchens. If be interested, you have opportunity to descend the tunnels to understand how harshly the Vietnam guerrillas live during the war. 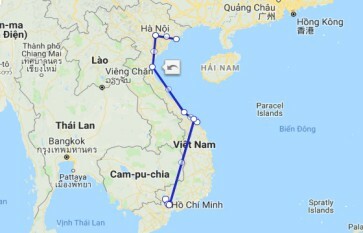 You will be transfer from Ho Chi Minh City downtown to Cai Be district in morning. Arriving in Cai Be, you will be welcomed by the hospitable smile of the host and invited some fresh fruits before embarking on boat to visit Cai Be Floating Market and traditional handicraft villages. You will have an opportunity to talk to the sellers on their boats. The boat will then lead you to the home-stay on Tan Phong Island for checking-in and having lunch. Waking up in the early morning to enjoy the fresh air of Mekong region and then taking a stroll around the home-stay, your 2nd-day tour in Mekong will start. time, you will join a bicycle tour around Tan Phong Island to visit the traditional handicraft workshops of handbags, rice papers along with wooden tables and chairs. Afterward, we will return to the home-stay for check out. Have lunch at home-stay. Then, small boat will transfer you back to the Cai Be tourist boat wharf and transfer back to Ho Chi Minh City Airport for your departure flight. End services. Hope to serve you again. This is a good tour if you wish a fairly relaxed and cost effective approach. Generally, we had about 1/2 every day of free time. The highlight for us was Halong Bay: beautiful, very nice boat. The two nights we spent in Hoi An were not too interesting. Hotel in Hoi An was delightful(we were using the 3 star option). The custom tailor coupon was actually very nice addition. The hotel in Saigon was pretty ragged--would definitely upgrade on that one. Otherwise everything was good. The guides were always helpful, but not quite up to what you would find on a larger tour group--ours was only 5 people. Good trip The trip fulfilled our expectations. Good with local guides. Accommodations were good. Asia Package Travel service was ontime on the whole trip.